(Phys.org)—A pair of researchers became convinced over a period of years that the famed North American Columbian mammoth is actually the same creature as the Eurasian steppe mammoth (Mammuthus trogontherii)—it simply migrated over approximately a million and a half years ago. In their paper, by the now deceased Andrei Sher and his colleague Adrian Lister, published in the journal Science, the team suggests that worn teeth might be behind the mistaken belief that the Columbian mammoth was actually a descendant of the European mammoth, Mammuthus meridionalis. Archeological evidence suggests that all mammoths got their start in Africa, approximately five million years ago—they subsequently migrated to Europe and then to Siberia and China. Along the way, those that made their home in Eurasia changed dramatically to allow for the colder climate—growing longer hair, for example and developing more complicated teeth to help with eating the different sorts of grasses—this led to them being labeled as more evolved by the science community. When mammoth teeth were found in many places across North America, it was assumed they had evolved from the European version of the mammoth, because the teeth appeared to be less evolved. But now, Lister contends, that thinking may be flawed. After thoroughly studying and comparing tooth fossils found in North America with those found in Eurasia, he has concluded that they are from one and the same animal. He suggests the reason for the confusion lies in the state of the teeth—most mammoth fossils found in North America, he notes, have been of older animals—animals whose teeth have lost some of their more complex features as they aged, making them seem to be similar to teeth from European mammoths. Lister suggests that some Steppe mammoths migrated to North America sometime between 1.5 and 2 million ago, by crossing the Bearing Strait, and evolved into what became the Columbian mammoth over many more years. He also suggests that European mammoths also migrated some time later, though they appear to have remained in the northern part of the continent, and likely mated with Columbian mammoths creating mixed offspring. Mammoths provide a detailed example of species origins and dispersal, but understanding has been impeded by taxonomic confusion, especially in North America. The Columbian mammoth Mammuthus columbi was thought to have evolved in North America from a more primitive Eurasian immigrant. 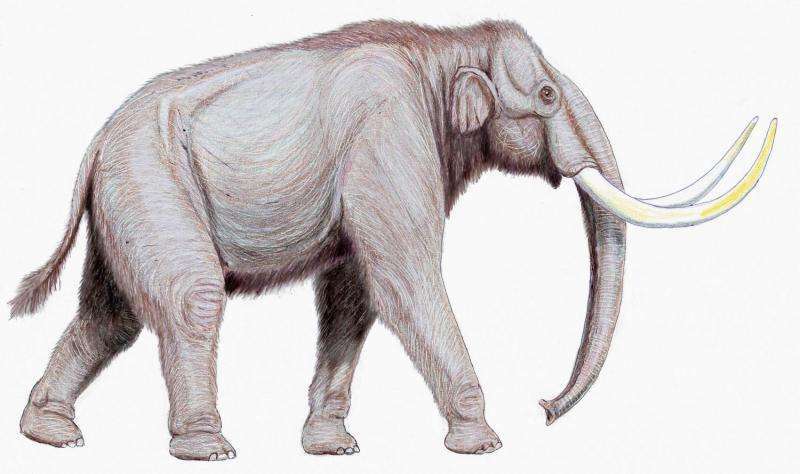 The earliest American mammoths (1.5 million years ago), however, resemble the advanced Eurasian M. trogontherii that crossed the Bering land bridge around that time, giving rise directly to M. columbi. Woolly mammoth M. primigenius later evolved in Beringia and spread into Europe and North America, leading to a diversity of morphologies as it encountered endemic M. trogontherii and M. columbi, respectively. In North America, this included intermediates ("M. jeffersonii"), suggesting introgression of M. primigenius with M. columbi. The lineage illustrates the dynamic interplay of local adaptation, dispersal, and gene flow in the evolution of a widely distributed species complex.